I've had a couple of questions about how I use the light-deflecting wand we learned how to make in this post. The best way to answer that is to show you. Pictured: a close-up of a freckly-blodgy-spot on the side of my nose that shall be the subject of this exercise. 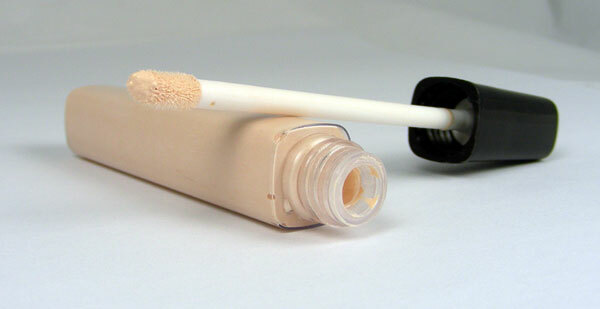 I know some prefer to apply concealer on top of their foundation, but I do it the other way around. I always start with the concealer, then add foundation. 1. Apply a small amount to the desired area. 2. Tap gently to distribute and tone out the color. 'Tapping' the color on works really well for me. 3. One layer: Light deflecting magic! If you look for it, the spot is still visible, but it no longer 'draws attention'. 4. Two layers: a concealer effect, (bottom pic).